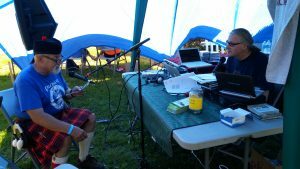 Charlie of Clan Fraser came by the Highland Games tent to share the history of his clan. This interview is hosted by Joe Blades, and Charlie looks to spread the outreach of his clan. The message here is one of respecting heritage, sharing history and attempting to reconnect after many years, so that the next generation may know their lineage and may be able to continue their family’s culture and traditions. Woooot! He is my oldest male cousin and is very passionate about our family history as is I.
Glad we could help with representation! He was very passionate and we were happy to have him at our tent over the weekend.